Perhaps you still remember that a tsunami ever hit the area on 17 July 2006. An undersea earthquake measured at 7.7 Richter scale generated a three meter high tidal wave that caused wide damage. Hundreds were killed including a small number of foreign tourists (source: Wikipedia). 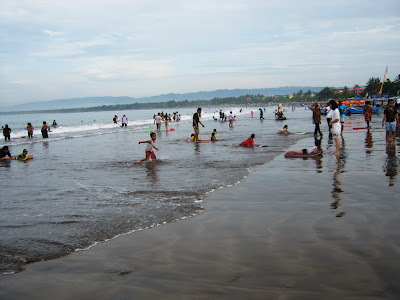 Now, Pangandaran Beach (Ciamis, West Java, Indonesia) is already beautiful again. Since it’s holiday season, you can see lots of visitors there. My husband captured this moment last Wednesday. 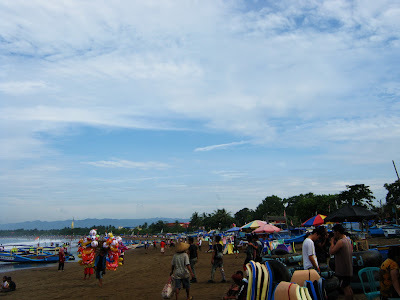 On the way back home from his home town, my husband and SIL decided to visit Pangandaran Beach. I didn’t go along with them since I’m not in my good health. Arrived at the beach Tuesday night, they spent one night in a hotel and continued the ride the next day, after enjoying short times around the beach.